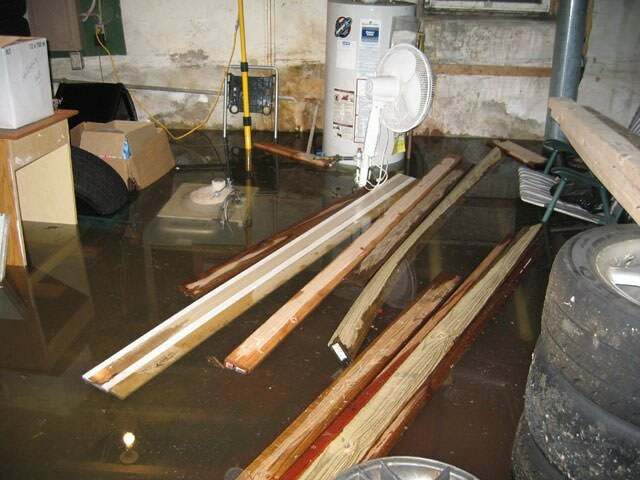 There are a variety of possible causes of a wet basement. Although structural problems are often to blame, poor drainage or plumbing leaks can also trigger moisture or flooding. Here, a basement waterproofing pro reviews the likely culprits and how they can best be dealt with. A clean, dry basement—there, doesn’t that sound nice? Yet the fact is, many of us live with basements that are damp, which makes them unpleasant to visit and inhospitable for our belongings. To find out what makes a basement damp and what can be done about it, we reached out to John Mitchell, owner of All-Dry of the Carolinas, a basement moisture problem-solver based in South Carolina. According to Mitchell, there are three common causes of flooded or damp basements: backfill saturation, surface water, and plumbing leaks. Backfill saturation causes water to enter the basement due to what is known as the “Clay Bowl Effect,” says Mitchell, which is a result of the way in which your foundation was installed. First, a big hole was made in the earth and then the foundation was poured, leaving a gap between the foundation walls and the existing earth. That gap was filled with the soil that had been removed and “fluffed up.” Because this soil is looser and more aerated than the soil around it, which may have been compressing for hundreds of years, it tends to absorb more water than the compacted soil does, much like a sponge in comparison with a brick. More water against your house leads to hydrostatic pressure. This basically means that water, which is heavy, presses up against your foundation and can then find its way in through cracks, windows, openings around pipes, or even through the concrete itself, which is porous. Waterproofing, on the other had, is much more effective because the coating is typically 40 millimeters thick and is either sprayed on or installed as a membrane. So what can be done if you find out that your basement is leaking due to a structural problem? One solution Mitchell’s company recommends is the installation of a perimeter drainage system around the edges of the basement floor inside the house. 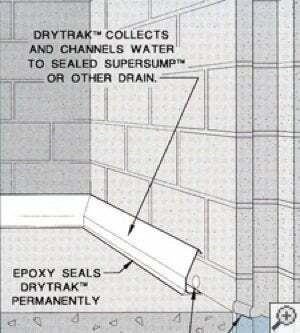 Some of these systems involve jackhammering the concrete floor of the basement around the edges to install the drain, but other systems, such as DryTrak, can be installed above the floor. Both systems allow water to enter but then quickly collect it and funnel it away to a sump pump that delivers it to an adequate drainage site outside the home. Other issues that could lead to a moist basement include incorrect grading and drainage around the home. Mitchell explains: “The perimeter footing drain may be installed too high and may not drain to daylight. Not having used enough gravel may be part of the issue since gravel is expensive. Another possibility is that the gutter’s downspouts may not extend beyond the backfill or gutters may be clogged and overflowing onto the backfill. Or the grade may leave surface water pooling next to the house, and as this water enters the backfill it can carry loose soil particles to the footing drain, at some point clogging the drain and giving you backfill saturation. Surface water can also cause basement flooding by running or pooling next to the house and running over the foundation wall. This is why good grading and extending gutter downspouts away from the house is important. Have your gutters cleaned after the leaves stop falling,” he advises. If your water leakage problem isn’t foundation-wide, a basement waterproofing expert can determine if it’s entering through cracks in the floor or windows and repair those cracks to keep it from coming back. Sometimes water in the basement isn’t the fault of the foundation. The moisture may simply be due to a leaky water heater or pipe. “Leaking water heaters, plumbing leaks, and burst washing machine hoses are the leading sources of homeowner insurance claims,” says Mitchell. So how to combat these plumbing problems? This is certainly a wise move. Mitchell notes that “a burst washing machine hose with 50 pounds of pressure will flow 500 gallons per hour,” which could quickly turn your basement into a swimming pool. And while an in-home pool might sound nice, that’s probably not the best way to go about getting one.